It was the coldest day of the year. I was in Leeds waiting for the train back to London. Despite several layers of warm clothing I was shivering uncontrollably. A friend who I was travelling with stood next to me wearing nothing but an open-neck shirt, a pair of jeans and sandals. “Aren’t you cold?” I asked in amazement? “Of course I am” he replied. “So why don’t you bundle up?” “Its winter” he said as if talking to a child “in winter it’s natural to be cold and it’s no use trying to fight it.” Given my own pathetic attempts to stave off the chill I had to admit his point wasn’t entirely without logic although it wasn’t enough to convince me to abandon my heavy coat and join him in shirtsleeves. And while I still believe in trying to mitigate the harsher elements of seasonal change by dressing appropriately I have come to the conclusion that in so many other areas of life trying to reverse or suspend change is an entirely futile exercise. All one can do is accept and adapt. This is particularly true of relationships. If I think back of what it was like to hold my first child in the weeks after his birth I recall a vulnerable passive infant who couldn’t survive a day without our care. I was the giver, the source of life, the protector. It’s an extraordinary feeling when you realize how much a tiny life depends utterly on you; it’s awesome and exhilarating. Yet as any parent knows this stage does not last forever. Within a couple of years your helpless infant has grown into a rambunctious toddler constantly pushing boundaries and asserting his independence. Move on several years and your eight year old no longer wants you to hug and kiss him at the school gates. Before he is even in his teens he will gradually stop confiding in you. He no longer thinks of you as the font of all wisdom and at times, he frankly thinks of you as an idiot. And then come the teenage years where he will simply stop talking to you, sometimes for weeks on end, although he appears perfectly capable of conversing with his friend’s parents. And here is the thing of it. It’s not personal. Its natural and you were a fool to think otherwise. Especially when you behaved no differently to your parents, as did your parents to their parents. It is a pattern that stretches back to the dawn of human history. It is a pattern of inevitable change and we resist it at our peril. All we can do is learn to roll with it. The same is true on the other side of life when one detects change in one’s parents as a result of aging. For a child this can be an extremely distressing period in life. A parent who the child always perceived as strong suddenly appears frail. A parent who was always decisive unexpectedly becomes hesitant and uncertain. A parent who was always the giver now becomes the receiver. And what makes this change in a parent so much more distressing than perceiving change in one’s child is the implication that one day we too are destined to change. Nothing remains the same for any length of time. Life is constantly shifting and moving beneath our feet. And while on the surface this is a rather depressing thought, it needn’t be if we learn how to embrace change and unpack its blessings. Because with each painful change comes the opportunity for new growth and new possibilities. The tender protective feeling a parent has for a newborn baby will eventually be replaced by a different, but no less powerful, feeling of pride when hearing one’s child speak his first words, or seeing him take his first steps. And as these precious moments pass they will be replaced by new moments ushering in new milestones producing new feelings of joy, pride and happiness; a Bar Mitzvah, graduation, marriage, grandchildren. Similarly on the other side of life the pain of witnessing one’s parents aging, getting weaker, more vulnerable can be tempered by a tenderness and honesty previously unknown. Unspoken feelings, buried resentments, unfulfilled expectations all have a way of surfacing and resolving themselves against the backdrop of a rapidly emptying hourglass when one realizes the truly important things in a relationship. Every new stage in life consists of pain and joy, beauty and dread. The challenge is to accept the present, to celebrate it and make the most of it while it lasts. Those who are able to do so successfully experience not just a fuller, richer present, they are also able to look back on past moments with sweeter memories that no amount of change can ever dislodge. Accepting change in this way is one of the central themes of the Jewish Festival of Sukot. During this festival we recite a special blessing over the etrog (a type of citrus fruit.) The Bible calls this fruit pre etz hadaar (ie the product of hadaar trees.) 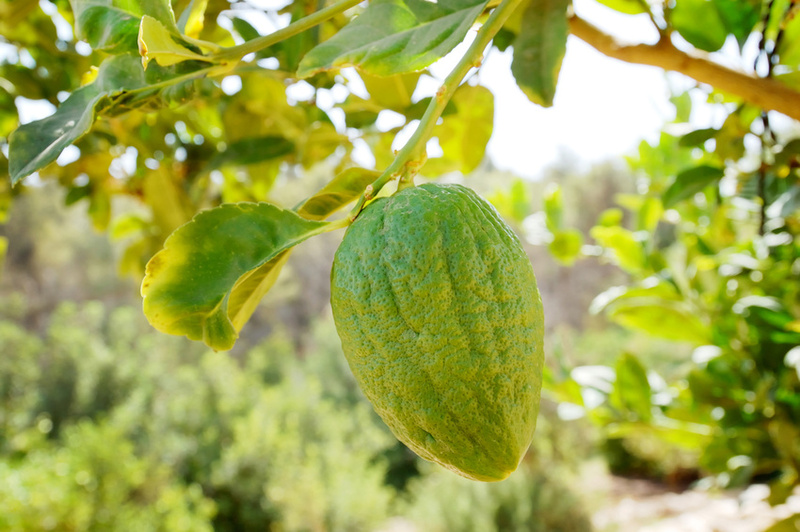 The Talmud identifies this as the etrog, which unlike seasonal fruit, continues to grow (Hebrew ha-dar) through all seasons. Hadaar also means beauty in Hebrew and so the Talmud relates the notion of beauty to the ability to weather change and to grow from each new moment and experience. The festival of Sukot inspires us to live mindfully in the moment and to unpack its inherent blessings for as long as the moment lasts and then to do the same with the next phase of life when it comes. The bible calls Sukot zman simchateinu the festival of joy, for only by embracing change and living in appreciation of each moment one can achieve a deep sense of happiness and satisfaction. This entry was posted in Uncategorized by rabbibrawer. Bookmark the permalink.